The Alma Sinon laser system is a highly powerful Advanced Q-switched Ruby Laser with Long Pulsed Mode. Designed for professional aesthetic cosmetic procedures, the Sinon delivers safe, gentle removal of all types of tattoos and skin lesions through fast, effective treatments. Offering the shortest rate of pulses of all dermatological ruby lasers, the Sinon delivers highly targeted, focused laser treatments that are suitable for all skin types. By utilizing a combination of a high working speed with a powerful, deeply penetrating wavelength, the Sino gets rid of undesired tattoos and pigmented lesions gently, quickly and completely. The Alma Sinon can get rid of all types of tattoos, including those with the deepest and darkest pigments. By utilizing an easily adjustable spot size for precise targeting, the Sinon laser system gets rid of tattoos and skin lesions without harming the surrounding area. The innovative Sinon laser works in fewer visits than many other systems and won’t cause scarring or pain during treatment. SunrayLaser.com is an authorized reseller of the Alma Sinon. Interested in adding the Alma Sinon to your practice? The Sinon is the perfect addition to any busy cosmetic practice looking to expand its service offerings to include safe and effective tattoo removal treatments and treatment for hyper pigmentation and removal of skin lesions. SunrayLaser.com has amazing deals on used Alma Sinon laser systems with savings that are up to 60% off the original price! 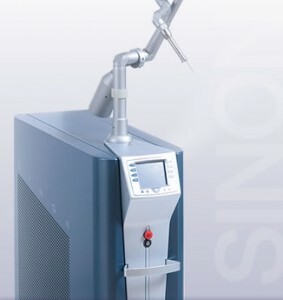 See for yourself how much you can save on high quality tattoo removal equipment like the Sinon and other used laser equipment when you buy from SunrayLaser.com. If you are looking for pricing information on a pre-owned Sinon system, fill out the contact form below and we’ll send you a free, no obligation quote.